Some friendships do not end with arguments and drama. Sometimes friends disconnect emotionally over time until their relationship is no longer the same as it was in their early days. Friends can drift apart suddenly without any reason. When best friends drift apart, they may get back together later on. However, for some friends, the drift marks the end of their friendship. People change all the time. You may realize that your friend is not the same person you used to know. Change is part of life. You also have changed over time only that you have not seen the change yet. You need to give up the friendship if you are the only one trying to make it work. Friendship takes at least two people to work. In this case, avoid dwelling on the idea that your friendship will be repaired someday. Do not ignore the change in your friendship either. If nothing can change the drift, then admit to yourself that you need to give up and that you've lost a friend, no matter temporarily or permanently. When best friends drift apart, enough time is needed to process the change. You need time to get over the loss. Do everything you can to overcome the negative feelings that come with the change. For instance, try hitting the pillows, screaming, or playing loud music. Losing your best friend may sound like the worst thing that could ever happen to you. However, you must realize that losing you is the worst thing that could happen to your friend too. No matter who caused the drift, It's not easy for both of you and you share the same suffering. When best friends drift apart, all of you have an opportunity to rediscover who you really are. Use the time to find yourself. Find the person you are without your friend. A friendship cannot work if two people are functioning on different wavelengths. Even if you try to make it work, you will not be happy. So, just let things be and use the opportunity to think about what you want to achieve and who you want to become. Look for new friends who have the same interests. Your new friends may help you heal from the pain of losing your best friend. You will feel better when you are assured that you are not alone, that other people appreciate you, and that you have new friends to support you if needed. Spend more time with your current friends to know them better. You may realize that you can be best friends with one of them but just never thought about him or her before. Do go out, get to know more people and see where the new friendship ends up. You will be strong enough to let go after dealing with your feelings. The change will be more difficult to process if you keep holding on to the frustration and anger. Make a decision to release all the negative feelings inside. The hold that you friend had over you will release and you will be able to move on. Look for things to do that will get your mind off the loss. Your pain will lessen when you are busy and engaging in constructive activities. Joining a club or hobby group is also a great way to overcome the loss of a friend who was a huge part of your life before. What's more, you are likely to meet new friends who share similar interests there. Good memories do not fade even when best friends drift apart. 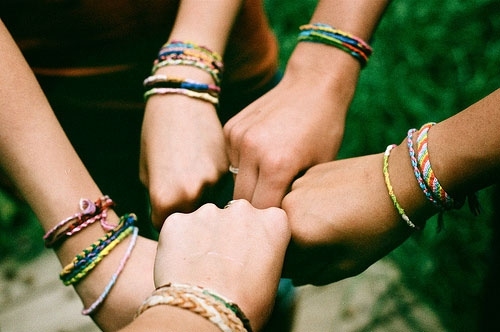 You do not have to let go of the good times you shared with your friend when the connection ends. Think about your friend often, recall the good memories you had and laugh about old times. You can love your friend and treasure the friendship you had even if you no longer meet or talk on the phone late at night. When you lose your best friends for whatever reason, do not burn bridges. Do not be mean or unjust to your friends, which will destroy all the good memories of yours. Besides, you may meet with your friends and be besties or buddies again or need their help someday.